Hey Island Lake families! Although summer 2017 at camp is over and you’re probably concentrating on the school year once again, we’re already thinking about summer 2018. We thank you for all of your valuable feedback from this past summer and we will apply some of your great suggestions for next year. Now it’s time to reminisce this recent fantastic summer. We changed up Color War quite a bit to offer a greater variety of activities, and the response to this was very positive. We added lip sync battle and music videos as an evening activity. We also added cooking, fishing, science, theater, and much more to our daily sports. We brought back an old favorite, the bucket brigade, which included every single camper on each team. Of course, we kept many traditional events such as the rope burn, swim meet, tug o’ war, trivia game, battle of the bands (a few years old at ILC), the apache relay, and of course our final night sing. We were very happy to see more campers than ever involved during these 3 days of fun. We kept your children very busy during each of our Lazy Days during the 2 sessions. Our first Lazy Day was spent at Dorney Park and Wild Water Kingdom, which is always a camp fav. 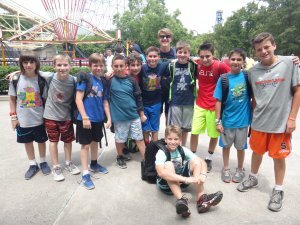 We split up the camp during other Lazy Days and sent them to a variety of places such as Sky Zone, Ithaca, bowling, movies, and Montage Mountain Water Park. Perhaps we didn’t allow your kids to be so “lazy” during these special days? Our annual teen trip to Cleveland, Ohio was a huge success. Our oldest campers actually got history lessons at the Football Hall of Fame and the Rock & Roll Hall of Fame. They even enjoyed hands-on experiences as well as an IMAX movie at the Great Lake Science Center. Let’s not forget the Cleveland Indians game when our whole group made it onto the jumbotron at the stadium! Lots of fun was had at Cedar Point Amusement Park, Dave & Busters, and Splash Lagoon indoor water park. Very soon we will start planning next summer’s teen trip to Toronto and Niagara Falls. Get those passports updated! Evening activities varied for every group, boys and girls, day to day. We had our share of group evening activities as well as full camp evening activities. Group activities varied: pool parties, giant messy twister (amongst our girls’ favorite! ), campfires, gaga, ugly fashion shows, photo scavenger hunts, Island Lake Game Night, and many, many more. Full camp evening activities that our campers loved the most were the big annual hoedown (see the blog from July 30th and photos from July 31st), dance socials, and ummmm, I think that’s it, right? Ooohhh yeah, I almost forgot,…Revival Night! Other summer 2017 memories include prank wars. Many bunks (and Matt, Trip, & Dustin!) got involved in this, some praks were better than others, but they were all in good fun. Should I even bother mentioning the wild weather we experienced this past camp season? Although the temps were cool it didn’t stop our kids from staying active. We did have quite a bit of rain but only 1 day at the end of the summer was a total washout where kids had to do indoor activities all day. The rest of the days had pretty quick rain showers that came and went. Those of you with girls, they definitely got some good wear on their rain boots this past summer, huh? On a positive note, we saw a great deal of Island Lake 5-year jackets throughout the summer! I’m sure you’ve heard even more camp memories from your children since the season ended. We hope your kids continue to talk about camp and see their ILC friends throughout the school year. Our annual camp reunion at Sportime USA will be here before we know it. It’s on Saturday, November 18th at 10am so be sure to mark it on your calendars. Details are in your monthly Island Laker newsletters. Until then, when we can see your children’s smiling (cleaner) faces once again, ILCUTHERE!